Where can I find rare or unusual plants in Connecticut? One of my goals this year is to visit nurseries I usually don’t have the time to do, but I’m making time. Last Friday, I picked up a tube leaf Ginkgo tree from Broken Arrow Nursery in Hamden, CT. I’ve always wanted a Ginkgo, and this one has unusual leaves where some are fused, so they look a bit rolled up. Latin name is Ginkgo biloba ‘Tubiformis’ and it will be fun to see once the leaves begin to expand. This nursery, located about an hour from my home town, has some of the more rare or unusual plants that you won’t find in traditional nurseries. Many plants are propagated by the nursery. So if you are a plant collector, or looking for unique varieties or cultivars, an hour’s drive makes the visit to Broken Arrow worth it. 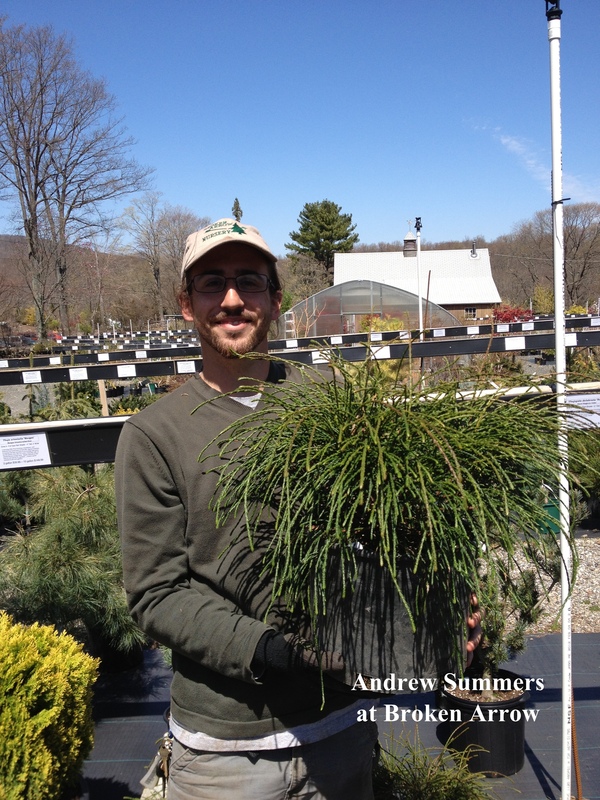 Unique conifers, trees, and shrubs are available at their site and via their well organized mail-order website. 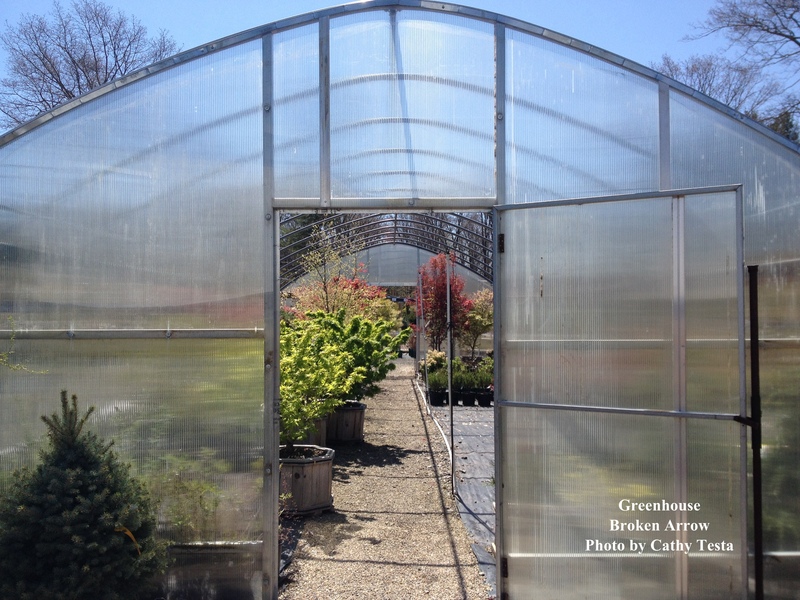 As I drove down the winding roads lined with old stone walls to their retail location, it reminded me of trips to another nursery, a wholesale one, called Sunny Border in Kensington, CT. Like Sunny Border, this place, Broken Arrow, is tucked within a nicely woodland landscaped area in a private section, where you get the sense it may have been started right out of the home. It is not on a main highway or roadway, and you would not really even know it was there unless someone told you. 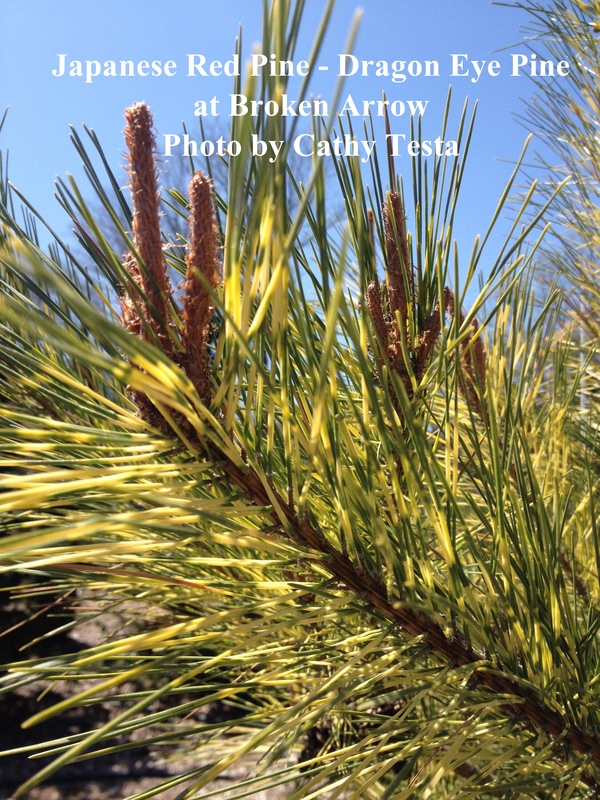 Upon my arrival, I recognized their symbol of a broken arrow with an tree. This is the place, I thought. And I knew right away, I was going to enjoy my visit when I saw deciduous and evergreen trees dug into the soil where you could see how they were growing here, rather than lined up in a field. However, they had plenty of plants lined up for sale too, with good signage detailing the important information about the plants. They have unusual conifers, such as this one called Dragon’s Eye. It is a variegated form of Japanese Red Pine. Latin name is Pinus densiflora ‘Oculus Draconis.” Yellow bands across the long needles give it a little something different to look at. It would be stunning in a garden of perhaps bright yellows as a theme, and you just don’t commonly see these in typical landscapes. Or how about this Whip Cord Western Arborvitae (Thuja plicata ‘Whipcord’). Andrew Summers, one of the welcoming staff members, took the time to discuss this plant with me along with other unique plants on the premises. His energy was inviting and he didn’t mind at all when I asked him to hold the plant for a quick photo for my blog. This plant is interesting looking and would look great in a rock garden or in a container garden. First thing that comes to mind is a big “face” pot, so the whipcord acts like hair! We discussed how it must be so difficult to work at Broken Arrow because of the temptation to buy many of the plants available. One could go broke here, especially if you have a passion for the rare. Andrew was quick to explain key features of several plants, which I truly appreciated. It is not often you find two people “ooohing” over the shape of a leaf, but we both were – it is just one of those plant geek things I guess – or for plant enthusiasts. As I continued through the nursery, I took a lot of photos for my research of plant materials – especially because this location is a bit far for me, I wanted to remember the plants I saw in person. 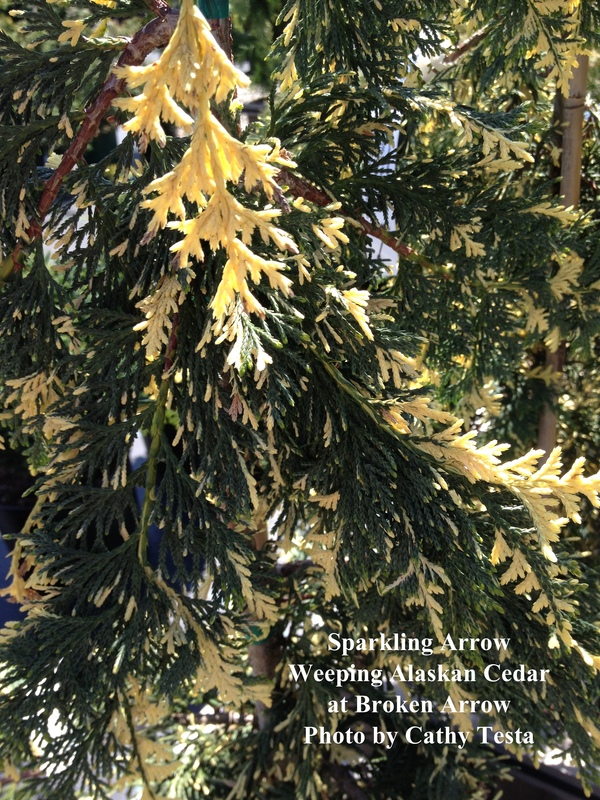 Take for example a form of an Alaskan Cedar with creamy white coloring with the green. Darn, I thought. I just bought one of these last week, and I like this one better – because it is different. There were some perennials, but not a huge amount (at least not yet). This place is a destination for trees, shrubs, and conifers. 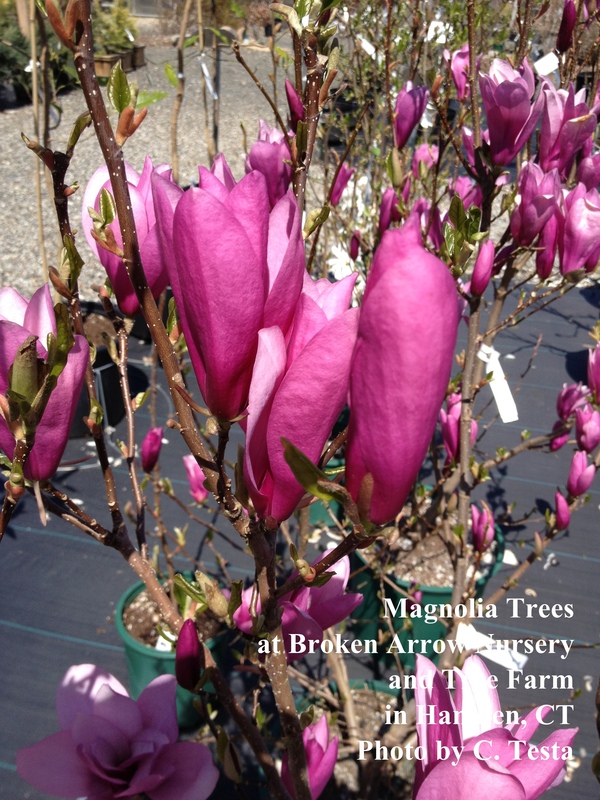 If you like Magnolias, they had at least nine different cultivars to pick from on the premises, and offer many more via their website and catalog. There were many full sized weeping Japanese maple trees and some compact dwarf sizes. 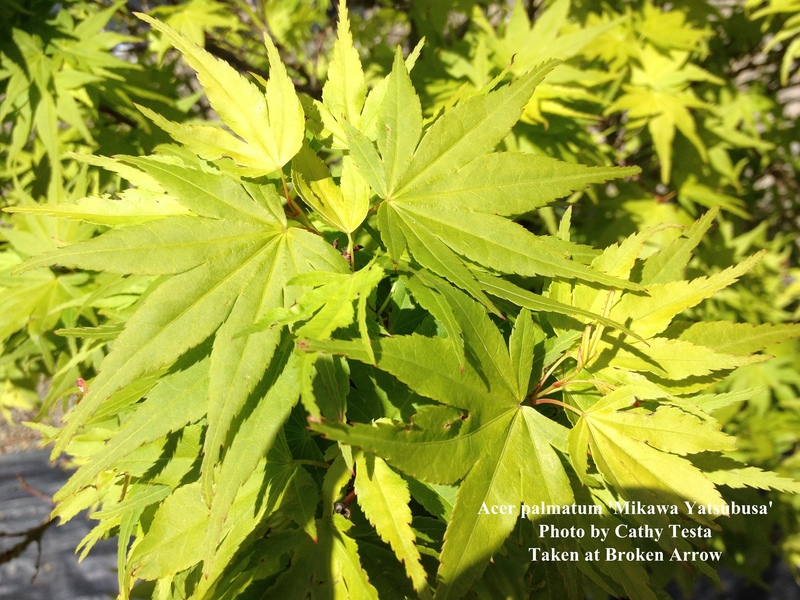 For example, take a look at the yellow foliage of a Japanese Maple Tree shown below of a dwarf type. The foliage greens up in summer on ‘Mikawa Yatsubusa’. The leaves are packed tightly on its branches, and it is just stunning in a container or perhaps in a Japanese garden. It caught my eye immediately. 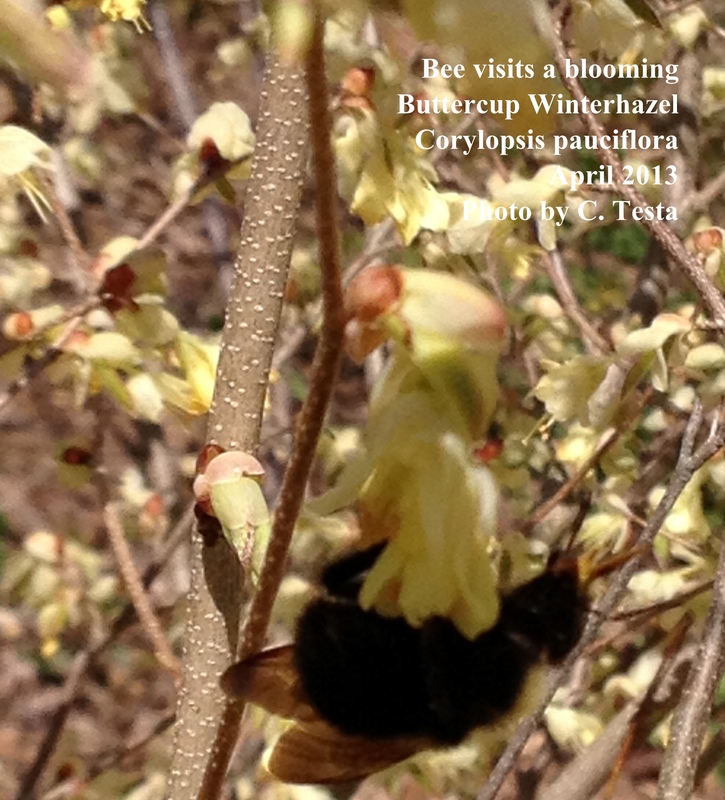 Many evergreen and deciduous shrubs, some really pretty Viburnums, Stewartias, Dogwoods, Witch Hazel, and more. Many of the plants are just beginning to awaken to the spring air and sun so flowers were not out, but I can imagine how this place looks when a bit warmer out. 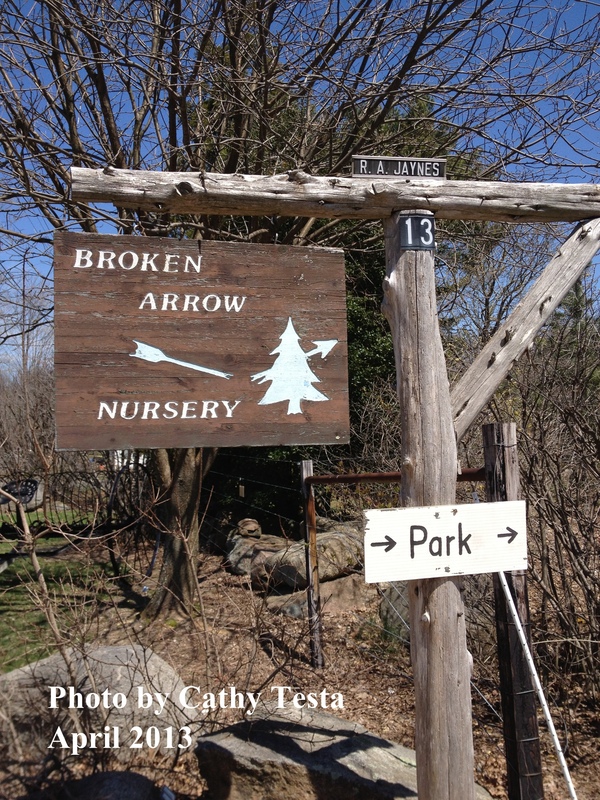 Broken Arrow is located 13 Broken Arrow Road in Hamden, Connecticut and is also listed in the new “Passport” being made available by CT’s Garden and Landscape Trail organization (see http://www.CTGardenTrail.com). You can get your Passport book stamped as you visit sites, and when you reach 10 sites, you can enter to win a $10,000 dream landscape – so I made sure to remember to bring my Passport with me. And by the way, Broken Arrow offers some really nice classes, and has a “thing for shade-loving perennials” per their catalog too. I didn’t make it to their tree farm section at another location nearby, perhaps I will save that for a fall or winter trip.